Just when the likes of Sony, Vivitek and Epson thought it was safe to get back in projector waters, JVC's D-ILA technology is back, making its rivals' lives very uncomfortable again with the DLA-HD950. The DLA-HD950 is a high-end (£6,000) model that should be amply equipped to show how far JVC's D-ILA talents have progressed since 2009's excellent HD350 and HD750. Especially as, like the HD750, the HD950 has breezed through the Certified Display Program of the world-renowned THX AV kit evaluation group. From the outside, the HD950 doesn't actually show much sign of progression over its HD750 forebear. That's not really a bad thing, though, since the elegant elliptical profile, curved rear corners, appealing glossy finish, recessed lens barrel and Sherman tank-like build quality are right up your average AV nut's street. As I expect of a £6K projector, the flexibility and finesse of the HD950's fully motorised optical adjustments is impressive. The zoom extends to an excellent 2x and you can shift the image 80 per cent up or down vertically, or 34 per cent horizontally. The latter should allow you to forgo the haphazard keystone correction system for getting the edges of your pictures straight. The HD950 can also be used with an external anamorphic lens, and its lens aperture can be set to one of 16 positions depending on your personal tastes/room set up, compared with just three available on its cheaper sibling, the HD550. JVC has made no secret about its desire to make headway in the custom install market, so it's natural that this PJ's connections include an RS-232 control port and a 12V trigger output. Inside, the HD950's optical wire grid D-ILA engine produces a claimed brightness output of 900 Lumens and contrast ratio of 50,000:1. This latter figure is particularly remarkable because it's a native figure, achieved without resorting to an image-dimming dynamic iris like those found on LCD and SXRD projectors. While the HD950 has so far talked a good talk, it hasn't really explained why it's better than the HD750. But if you look closely enough, there are potentially significant differences. 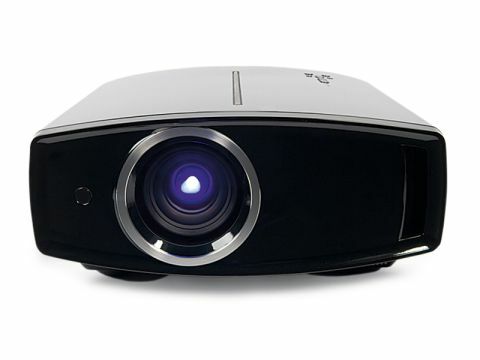 For a start, the HD950 is licensed with the ISF C3 system, enabling trained engineers to professionally calibrate the projector for your particular room and screen characteristics. Then there's the HD950's use of Clear Motion Drive processing. This proprietary JVC engine generates extra intermediate frames to reduce judder and boost clarity. Other key features include a dedicated THX picture setting mode; numerous Gamma presets, plus loads of flexibility for defining your own setting; and a colour management system that allows you to finetune the hue, saturation and brightness of all six of the primary video colours. It's worth stressing, too, that the HD950 doesn't skimp on 'general' picture processing, with the widely acclaimed HQV Reon-VX video processor onboard, complete with excellent I/P conversion, scaling and full 10bit 4:4:4 processing. Even though rival projection technologies have made considerable advances in the black level department recently, the HD950 stands out from the crowd when you're watching dark scenes such as the opening space battle of Star Wars III, recorded in HD from Sky (well, I had to go for a George Lucas film given this projector's THX certification!). There are three reasons why dark scenes look so tasty on the HD950. First, it just gets closer to producing a real, cinematic black colour than any other sub-£10K projector I've seen. Second, since it doesn't need to reduce brightness to produce a convincing black level, it makes dark scenes look much punchier, and more stable and consistent than projectors that use dynamic irises. Finally, the fact that the HD950 can maintain high brightness and deep black level response within the same frame allows it to reproduce levels of subtlety and clarity, when it comes to greyscale and shadow detail, that you just don't get anywhere else without spending megabucks. For instance, during the raid of the dark Nazca tomb in Indiana Jones and The Kingdom of The Crystal Skull (Blu-ray, another Lucas connection), I got a much richer sense of the texture and detail of the tomb's walls on the HD950 than I did on, say, Sony's similarly specced VW85. To get colours looking precisely how I wanted them, I had to visit the colour calibration screen. But if you can't be bothered with this, either the THX or Cinema 2 settings deliver very impressive 'preset' results. As noted before with D-ILA projectors, the HD950's Full HD images are stunningly sharp and detailed, clearly reproducing the grain in a good HD movie transfer, and picking out all those HD essentials like skin pores, blades of grass and Harrison Ford's wrinkles during Indy's adventures on South American plains. Add to all these glories an absence of noise (colour moire, the rainbow effect, visible pixel structure and dot crawl are all dismissed), a general feeling of jaw-dropping precision, and an exemplary running noise (JVC has somehow turned one of the noisier projection technologies into one that runs almost silently, and the low quoted 19dB figure seems entirely believable), and you truly have an awe-inspiring performance for a £5K-£6K price point. That's not to say I have nothing to moan about, though. I didn't take to the Clear Motion Drive system at all, for instance, finding its visible side effects tough to live with, even when watching HD (though it's not designed for use with 1080p24 BD material). It's just as well you can switch it off, although doing this inevitably results in a little judder in the pictures. But to me, at least, this feels sympathetic to the experience of watching a film in a cinema, and is never bad enough to actually distract you. My only other concern is that the HD950's exceptional accuracy makes it very unforgiving of poor quality sources. For instance, while playing Dragon's Age on the Xbox 360, I became aware of some quite distracting blocking and striping noise around the edges of some objects that I'd been blissfully unaware of while playing the game previously on Vivitek's budget, sub-£1K H1085 projector. So let's finish on the high the HD950 so richly deserves. It's an incremental improvement on the HD750 rather than a huge advance, but given how good the HD750 was, the fact that the HD950 improves on it at all – especially with colours and setup flexibility – has to be a cause for celebration.